The Fluke process meters combine a DMM and a Loop Calibrator in one rugged, handheld tool. Based on the trusted Fluke 87 DMM, the 787 adds the ability to measure, source, and simulate dc loop current with 0.05% accuracy and 1 microamp resolution. The New Fluke 190 series are having 4 channel models designed for the industrial plant maintenance professionals servicing, installing or maintaining heavy duty electrical equipment, electro-mechanical machinery and plant automation control systems. The 190 series II are the first IEC 61010, 1000 V CAT III / 600 V CAT IV rated portable oscilloscope designed to be safely used on industrial equipment that is permanently installed on the electrical distribution system. It is a battery operated portable instrument with a sealed, dust and drip proof case that is IP 51 rated, designed to be used in harsh environments. The compact ScopeMeter 120/225 Series is the rugged solution for industrial troubleshooting and installation applications. It’s a truly integrated test tool, with oscilloscope, multimeter and “paperless” recorder in one affordable, easy-to-use instrument. Find fast answers to problems in machinery, instrumentation, control and power systems. measure mA signals for PLC and control system analog I/O without breaking the loop and measure output signals from transmitters without breaking the loop. These milliamp process clampmeters source, simulate and measure mA signals in circuit. The Fluke 715 Volt/ mA Calibrator delivers outstanding performance, durability and reliability. 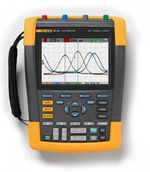 Offered in the rugged Fluke 80 Series DMM package, the calibrator is compact, lightweight, and easy to carry. With a push button interface similar to the multifunction Fluke 740 Series Documenting Process Calibrators, the 715 is easy to use. It is EMI tolerant, dust and splash resistant, and features a removable battery door for quick battery changes. The Fluke 714 Thermocouple Calibrator delivers outstanding performance, durability and reliability. The calibrator is compact, lightweight, and easy to carry. With a push button interface similar to the multifunction Fluke 740 Series Documenting Process Calibrators, the 714 is easy to use. It is EMI tolerant, dust and splash resistant, and features a removable battery door for quick battery changes. The new Fluke 724 is the master’s answer to temperature calibration. The Fluke 724 can measure and source 10 thermocouple types and 7 RTD types, plus volts and ohms. The Fluke 724 even handles high-speed pulsed RTD circuits and provides loop power. The dual line measure/source display lets you source temperature and view loop current at the same time. The Fluke 717 Pressure Calibrators delivers outstanding performance, durability and reliability. These calibrators are compact, lightweight, and easy to carry. With a push button interface similar to the multifunction Fluke 740 Series Documenting Process Calibrators, the 717s are easy to use. They are EMI tolerant, dust and splash resistant, and feature a removable battery door for quick battery changes. These calibrators come in 9 models measuring pressure up to 5000 psi/345 bar and are compatible with Fluke 700Pxx differential, gage and absolute pressure modules to increase functionality. The 744 combines HART communication capability to deliver an integrated communicating calibrator. This rugged, reliable tool is ideal for calibrating, maintaining, and troubleshooting HART and other instrumentation. The 744 does the work of several tools - sourcing, simulating and measuring pressure, temperature, and electrical signals in one rugged, hand-held device. For documentation, the 744 automates calibration procedures and captures your data. And, of course, it helps you meet rigorous standards like ISO 9000, FDA, EPA and OSHA regulations.